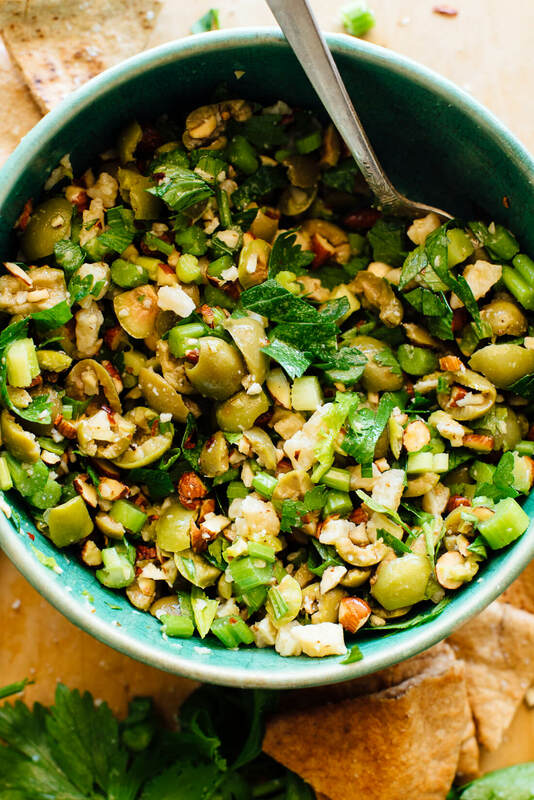 To make this recipe in a hurry, buy pre-pitted olives and tear them by hand into a few pieces. You can use jarred or canned green olives, or pick out your favorites at the olive bar at your grocery store. 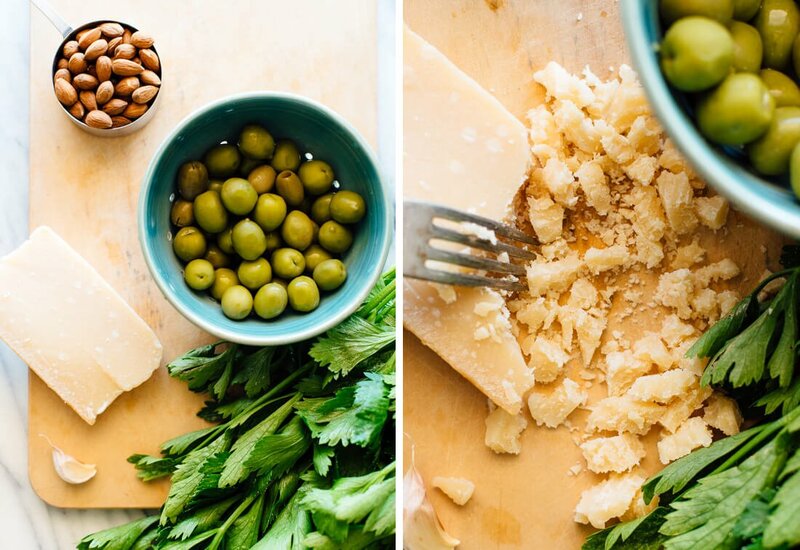 I’ve recently fallen in love with Castelvetrano olives, which are buttery, crisp and less salty than most. I almost always recommend buying raw nuts and roasting them yourself for the best flavor, but if you have a trustworthy source of tasty (unsalted!) roasted almonds, that would save you some trouble, too. Buy the freshest organic celery available, but don’t stress if it doesn’t have pretty leaves to add to the mix. This recipe has a mix of Mediterranean flavors and goes great with creamy hummus and crackers or toasted pita bread. 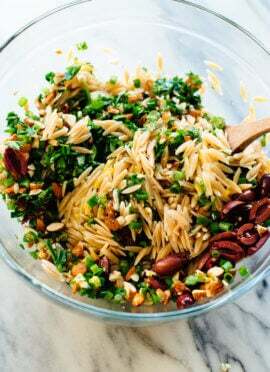 Deb suggests that if you’re serving this at a party, prepare the olives/Parm/celery in larger pieces that guests can spear with toothpicks—I like that idea! Please let me know how this recipe turns out for you, and check out Deb’s book. 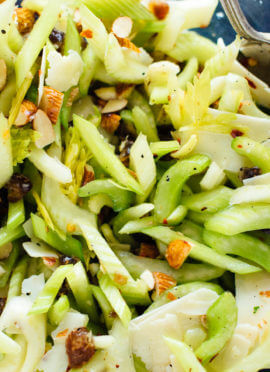 For a similar but lighter celery option, don’t miss this celery salad with dates, almonds and Parmesan. 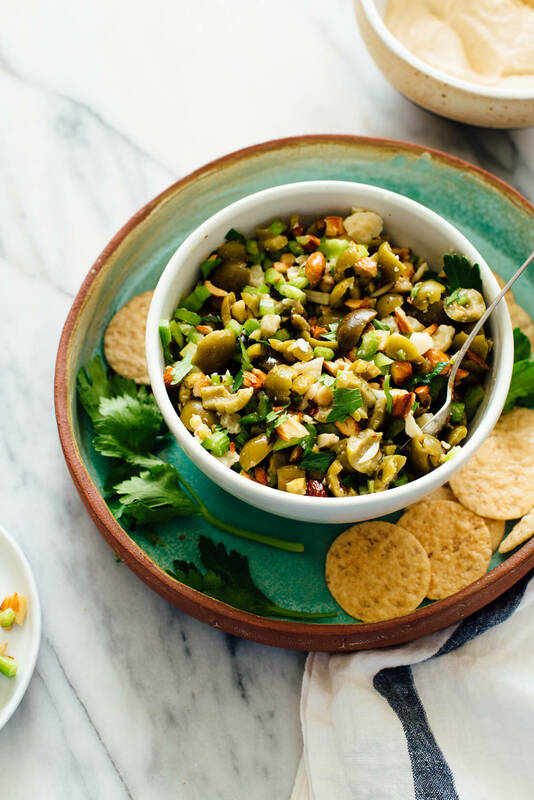 This fun Mediterranean appetizer features briny green olives, crumbled Parmesan, crisp celery, and toasted almonds. Recipe yields about 2 cups, enough to serve 4 to 6. In a medium bowl, toss all of the ingredients except the celery leaves together. Taste, and adjust the seasonings to your preference (I usually add a little more olive oil and vinegar, and about ¼ teaspoon kosher salt). Garnish with the chopped celery leaves. Refrigerate until needed, for up to 5 days. Recipe adapted just the tiniest bit from Smitten Kitchen Everyday by Deb Perelman. **How to toast your almonds: I roasted whole almonds on a rimmed baking sheet for 12 to 14 minutes at 350 degrees Fahrenheit, then chopped them. This is such a creative idea. I love this combo! All of your recipes are wonderful and this sounds unique and delicious. I can’t wait to try it! This looks delicious. Where do you find VEGETARIAN chunks of Parmesan? I can only find grated or shredded in tubs at Whole Foods, thanks. You can get a block and then crumble it. A fork works nicely! I made this for last night moon eclipse party and yes, it is great! It is so creative and unusual mix of ingredients! But it is amazing how well different tastes and textures make a perfect combo ! And you were right, my guests wanted the recipe (and you got new followers as well :) ). Thank you! Wonderful, Jonna! Thanks for the review. This sounds like an all-star appetizer!! Made a big batch of this to eat for lunch this week. I added a little red onion to the mix and put it on top of lettuce. Delicious! Love the salty/briny flavor. 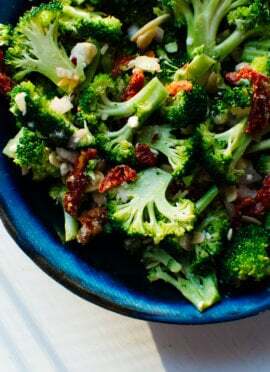 It’s a great recipe to switch up my usual lunch salads. Thanks for sharing, Sam! I appreciate it. so easy and yummy! I had only rice vinegar in the house and it worked fine – wonder how fresh lemon juice would have been. Thanks so much! so unique and yummy! I made this for the first time, and yes, my guests did ask for the recipe and they loved it. So I sent them to your website. It was really delicious! I wanted to make this as quickly as possible, so I used a bottle of already cut and marinated green olives with it’s own marinate as well as some sliced black olives. I can see where adding some hummus as a first layer would be delicious as well. Lovely! I’m happy to hear that, Mary. Thanks so much for your review. Made this and it was a hit! The flavors and textures together are so good. I substituted Apple Cider Vinegar because it’s what I had on hand and it turned out great! Thank you! That’s great! Thank you, Samia. I made this as a quick dinner for myself when I thought of this recipe at the grocery store to pick up some olives. I don’t like green olives but I love kalamata, so that’s what I used and it turned out really nicely. Of course those are really salty so I didn’t have to add any extra salt. Instead I added some red pepper flakes for heat (I like spicy food). I served it over some toasted Italian bread and arugula. It was a lovely light, quick weeknight dinner but didn’t feel sorry in the least. Will definitely make again. I made this for a “snacky” dinner (meaning we basically have large portions of snacks as dinner) along with fresh hummus, warm naan, pita chips, and egg salad (out of place here, but it needed to be eaten!) and it was AMAZING. I didn’t have almonds, so I used toasted pecans (my granny picked and shelled them) instead. They lent a nice sweetness, but I think almonds would definitely be the way to go and provide a better crunch. Will absolutely make again! I love “snacky” dinners! Thank you, Mandy for sharing and for your review. And, yes, it’s an amazing recipe, thanks! This looks amazing!!! I could eat this whole bowl! Torn olive was killer! I didnt have white wine vinegar, used tarragon. Didnt have almonds, used pecans, (unroasted). I served it with grilled burgers and grilled buns. Fabulous. 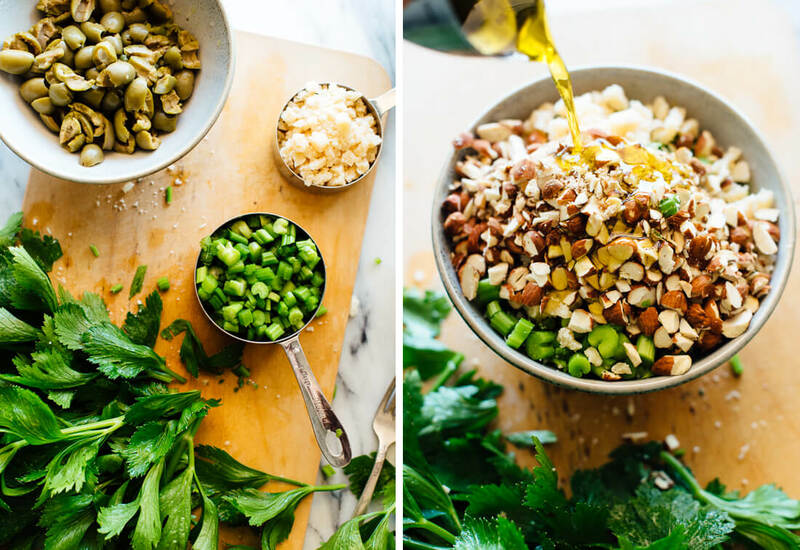 I LOVED this salad – salty, crunchy, cheesy goodness. It was perfection! This is a great recipe, so full of flavor! We only did a cup of olives and put it over chickpea pasta for a delicious dinner! That sounds delicious! Thank you, Dana for sharing. I appreciate your review.